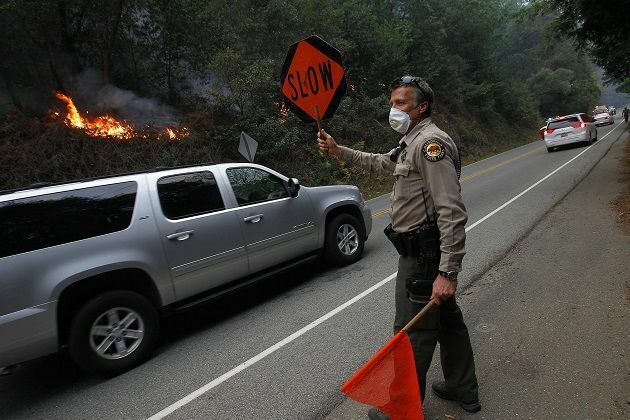 The fire currently burning in Pfeiffer Big Sur State Park, California, isn’t particularly large: As of the latest Forest Service report, it has burned 769 acres and is 20 percent contained. Nor is it particularly damaging: So far, 22 buildings or structures have been destroyed by the fire. (One was the fire chief’s home.) Compare that with the 2003 Cedar Fire in San Diego county, which destroyed 2,820 structures. However, it is markedly unseasonal: The California wildfire season was pronounced over on October 31, 2013. But of course, it isn’t over. And of course, it doesn’t help that the Big Sur area is currently experiencing drought conditions. It is also worth pointing out that for the state of California, seven of its 10 largest fires have occurred since the year 2000, including this year’s Rim Fire, the third largest in state history. Animal footprints are visible in dry and cracked mud on the bank of the half-full Bewl water reservoir in Kent on April 5, 2012. Governments worldwide are failing to do enough to tackle drought, which lacks the headline-making punch of a hurricane but can have an equally devastating human and economic impact, the UN weather agency warn. Governments worldwide are failing to do enough to tackle drought, which lacks the headline-making punch of a hurricane but can have an equally devastating human and economic impact, the UN weather agency warned Thursday. “A flood or hurricane is over within hours or days. A drought can last weeks, months, a season, a year. But droughts can cause as many deaths over time as any other natural disaster,” said Robert Stefanski, head of World Meteorological Organisation?s (WMO) agriculture division. Droughts in recent years have struck regions ranging from the Horn of Africa and the Sahel, China, India, Mexico and Brazil to the United States, Russia and southeastern Europe. Droughts are estimated to affect tens of millions of people and cause tens of billions of dollars in economic losses every year. Either rich nations will find a way to supply needy nations suffering from damaging climate effects “or you will have all kinds of unrest and revolutions, with the export of angry and hungry people to the industrialised countries,” Schellnhuber said in an interview. This past year’s seemingly endless stream of catastrophic storms wasn’t just a media narrative, according to Michio Kaku, a physics professor at the City University of New York. On CBS This Morning on Thursday, Kaku discussed 2012′s “wacky weather” and how global warming, which creates more energy circulating on the planet, exacerbates destructive tornadoes, storms, hurricanes and even forest fires. “You look at the weather patterns over the last year, and they all seem wild, extreme. What was driving that?” asked anchor Rebecca Jarvis. This summer, the United States experienced one of the worst droughts in history since the dustbowl. 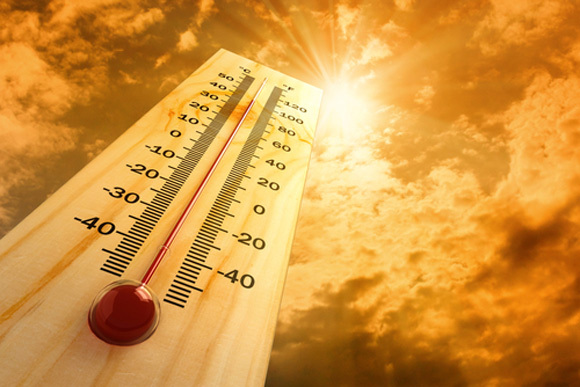 Farms went weeks on end without a drop of rain, particularly in the Midwest and, combined with high temperatures, resulted in a significant drop in harvest-ready plants. The drought affected numerous parts of the nation’s industrial sector as well as countries outside of the U.S. The United States has ample agriculture, if one part of the U.S. is experiencing drought and crop loss problems, then the whole food industry suffers as a result. While droughts are not uncommon, this summer the drought conditions were felt all over the United States, leaving almost all farms affected. 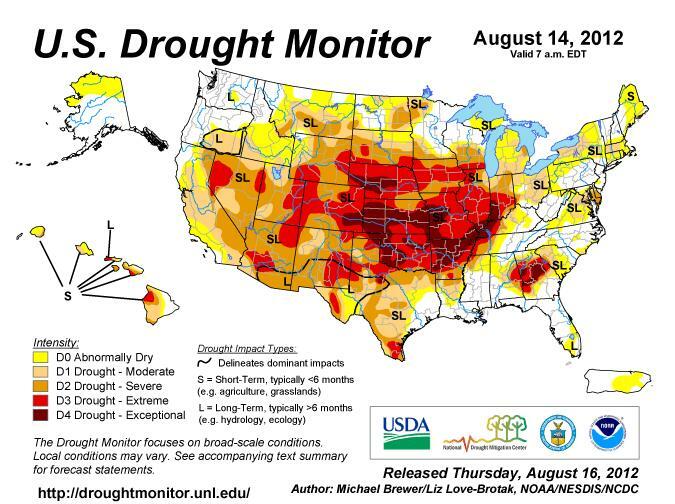 As the image shows, the majority of the United States experienced at least an abnormal dryness level. The Midwest and Southwestern parts of the United States were particularly hard-hit, experiencing severe to exceptional drought conditions.